Once you have a house, should you aggressively pay down the mortgage or invest in the stock market? This is a tough question to answer. In order to make additional payments on a mortgage, you need additional capital. This capital could either be used to pay down your mortgage aggressively or to invest in the stock market. So which one of these is better? The problem lies within framing the scenarios properly. You need to make some assumptions and largely ignore inflation of income and many life events for this to even become a feasible calculation, but I have tried to do it with 3 simple examples below. All of these assume that you have the ability to generate 1969$/mo to throw at either the mortgage or to re-invest in the market. All of these scenarios assume that you have already bought a house, and you will have a house when the 30 years are up, and it will have appreciated the same in all 3 instances. The baseline mortgage is selected as a 111,000$ 30 year fixed rate at 4.5%. In the first scenario, you will use 1969$/mo in excess of your mortgage amount to pay off your mortgage, then when the mortgage is paid off after 4 years, you will invest aggressively in the stock market for the remaining 26 years with everything you have got. Everything you have got will be 1969$/mo AND the money you will not be paying for principal or interest on that loan ($562.43.) In essence when you are done you will have a monthly input into the stock market for 26 years as your stock worth. In the second scenario, you will just invest every available dollar you have of $1969/mo into the stock market for the next 30 years, all the while paying down the mortgage as normal. This will be the non-mortgage-paydown version. 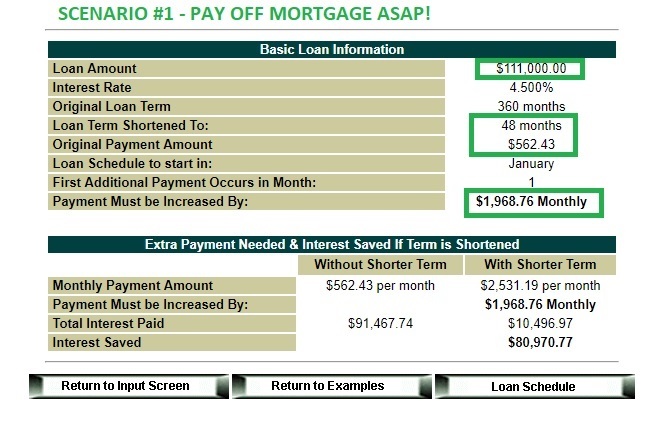 In the third scenario, you will invest 1969$/mo into the stock market, pay off the house at the 4 year mark, then proceed to take everything you have invested and re-invest it with the additional monthly amount available to you for having your mortgage paid off for the remaining 26 years. Basically you will get an additional 12,869$ left over from your stock market savings when you pay off your loan at the 4 year mark because the principal is only 103,327$ and you have saved 116196$ in the stock market. See the slides below if it is confusing I call this the "hybrid" scenario. So if it is so painfully true that not paying down the mortgage results in more principal over the lifetime of the loan, why would people ever pay down a mortgage at all? Seems like a tremendous waste of money looking at the above. Even I have advocated paying down principal on a mortgage loan before and I have personally done it. What gives? Well when you put money into a mortgage, the money is locked up for better or worse with the house unless you sell or do a cash out refi. Both of these things are very non-liquid events where it takes quite a bit of effort before capital appears in your account. My gut feeling is that most people would rather not pay off their mortgage and not invest in the stock market, they would go out and buy a new car or fancy clothes instead. The problem is that we are not most people and we should be holding ourselves to a higher standard. No longer is it enough simply to not spend money on stupid crap, you must also invest in the most efficient manner possible. I am quite afraid that with this article I have proved that paying down additional principal on your mortgage early is a monetary waste of effort, when instead an equal investment into the market will yield better results. Both of these approaches require the willpower not to buy things you don't need. Both of these things are hard to accomplish. But only one of them is the most efficient over the long run. Despite everything in that above paragraph being taken into account, it still appears to pretty much be a no-brainer as to how you proceed. Now go get started! Good luck trying not to touch the principal in your 4 million dollar account though when the stocks it is made of are completely liquid. I'm rooting for ya buddy!